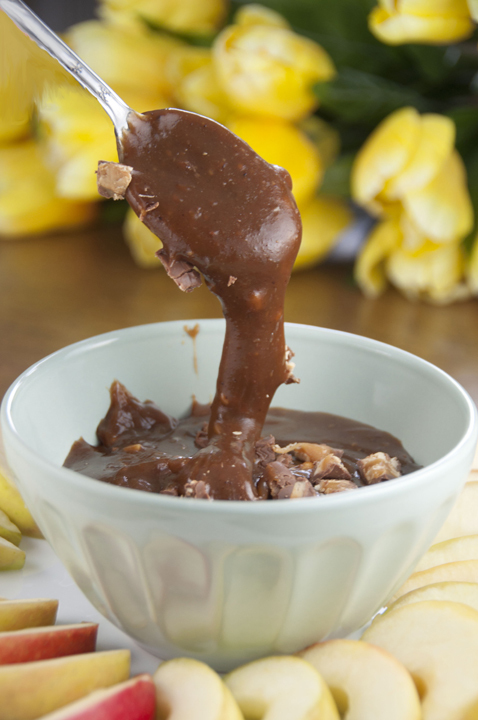 Use up those leftover fun-sized Halloween candy Bars and turn them into Snickers Caramel Apple Dip! A fun and easy fall treat or a great holiday dessert recipe! I know it’s still September, but I’ve got candy on the brain and this Snickers Caramel Apple Dip recipe would be a great way to use up Halloween candy next month. 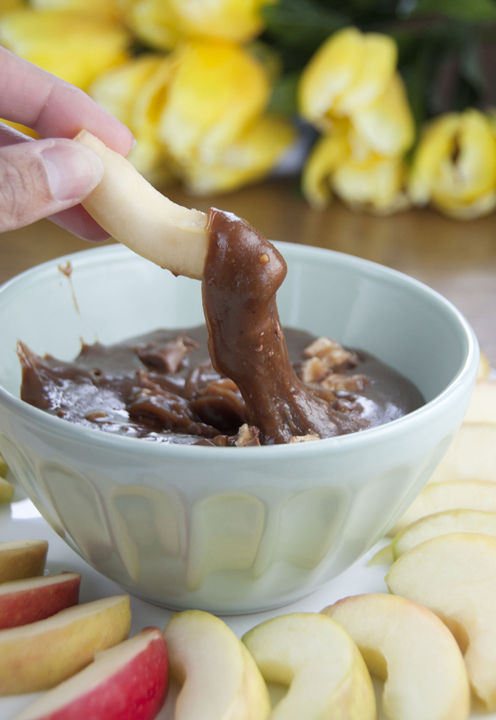 But you can make it any time of the year – I made it for a dip party! What better time to talk about candy than the fall? I have to admit that I’m not huge on chocolate candy. I know, I have issues. I prefer things like sour patch kids, chewy sprees, and skittles. But one of the few chocolate candies that is a weakness of mine is Snickers. Snickers are one of my absolute favorite candy bars and I knew I had to make a dip with them. I’m pretty positive that you could use any other chocolate-based candy bar in place of the Snickers that you like – Heath bars, Kit-Kats, Milky Way bars (especially if you are allergic to peanuts, these would be a great substitute). Get creative! This was delicious, but just to warn you, it made a HUGE amount of dip. I took it to the dip party, as I said before, and as we put a good dent in it, I had half of it leftover. 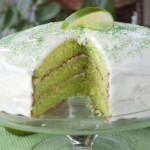 If it’s for a SMALL get-together (10 or so people), I’d recommend halving the recipe. 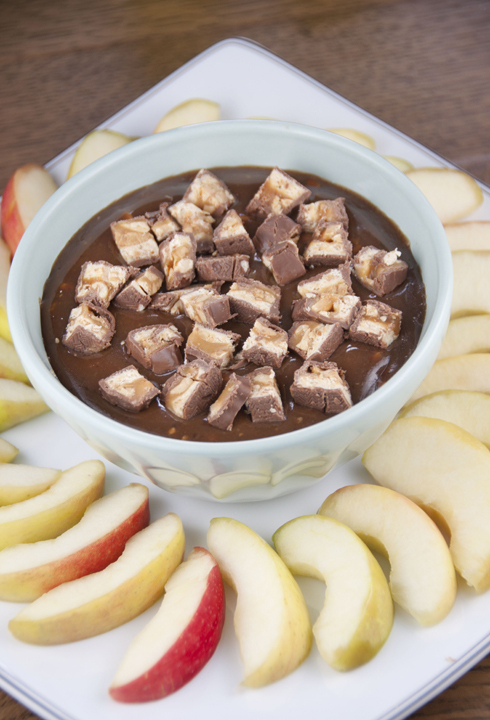 This Snickers Caramel Apple Dip would be perfect for a birthday or holiday party, baby shower, you name it! If you’re wondering what else you can serve this with besides the sliced apples like I did, pretzels, Ritz crackers or animal crackers would also be great. I tried to go the “healthy” route with the apples (ha ha). This isn’t a dip you want to eat frequently, but I’m a firm believer in “everything in moderation” and eating the bad stuff once in a while. 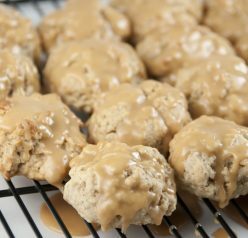 You should definitely also try my Caramel Apple Cheese Ball. It tastes like a snickers bar with the sweet and salty combination. Enjoy! 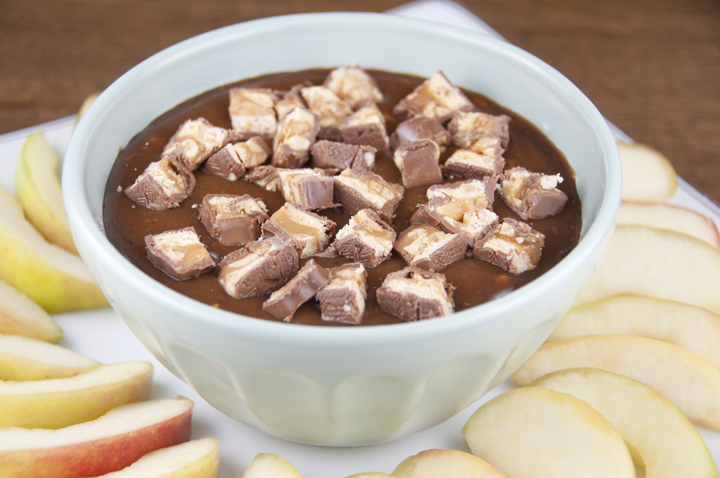 Use up those leftover fun-sized Halloween candy Bars and turn them into Snickers Caramel Apple Dip! A fun and easy fall treat! Melt butter in 2-quart saucepan; add brown sugar, corn syrup and salt. Cook over medium heat, stirring occasionally, until mixture comes to a full boil (10 to 12 minutes). Stir in sweetened condensed milk and cut up Snickers Bars. Continue cooking, stirring occasionally, until Snickers bars are completely melted (minus the peanuts, of course) and dip thickens up. Remove from heat; stir in vanilla and transfer to a serving bowl. Serve with sliced apples, pretzels, Ritz crackers or animal crackers. Take the two leftover Snickers bars, chop them up, and sprinkle them over the dip before serving. « Previous PostBlog Anniversary $250 Amazon Card Giveaway! Whoa I want to dive right into that bowl. What a great idea!! Looks incredibly addicting! I can always diet tomorrow. Pass over the snickers caramel dip…! Oh my word, I want to just dip my finger right into that bowl and give it a good lick. Yum. Oh dear…now I want chocolate…loads and buckets loads of it…this looks incredible, Ashley! I’m not even sure I’d make it to the apples … My spoon would just dive right in. I could eat this with a spoon! This would be great to bring to a Halloween party! I already am all stocked up on Halloween candy. I am a candy addict. I also love skittles and sour patch kids, and gummy worms and bears. I buy this huge 6 pound bag at Costco and slowly devour it. It takes months! This is a great idea! Perfect for all the yummy apples that are coming out now! This looks crazy good…but, I’m stuck on a Dip Party! That’s my kind of party. Just discovered sour patch kids…I’m obsessed, they. are. so. good!!! This looks completely delicious! Whoa!!! what a combination. Snickers dipped in caramel. I never thought of that! Thanks for sharing. Oh my word! I could eat this with a spoon! A dip party?? Now there’s something I would love! This sounds so so good! You just ain’t right. I LOOOOOOOOVE Snickers!! Now I have to make this dip and gain 5lbs. This is an awesome idea, Ashley! I love caramel, snickers, and apples! I will have to try this after we go apple picking. 🙂 Pinned! Oh wow – this would be perfect for a Halloween party – apples + Snickers! 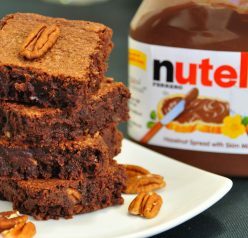 This looks delicious and decadent! This would be dangerous in my hands! Someone pass me a spoon!